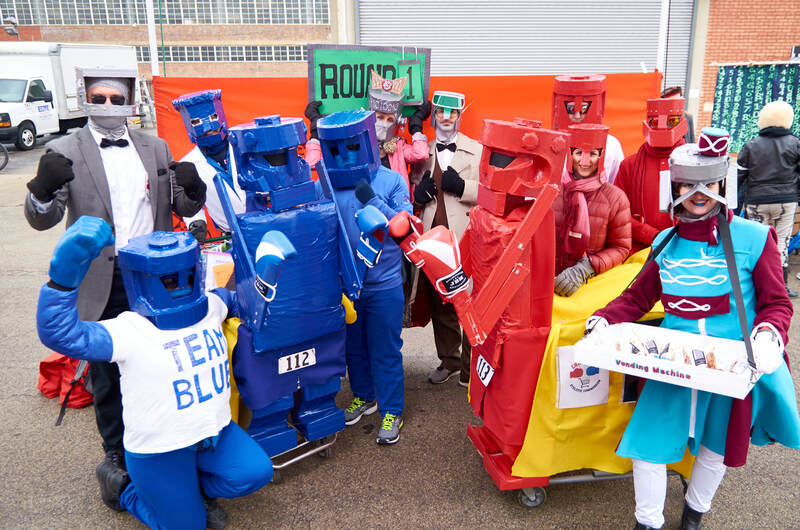 Nearly a thousand festive humans gathered on March 2, 2019 to create the annual spectacularly-festive, extraordinarily-costumed, epically-mobile food drive and charity shopping cart race — CHIditarod XIV. 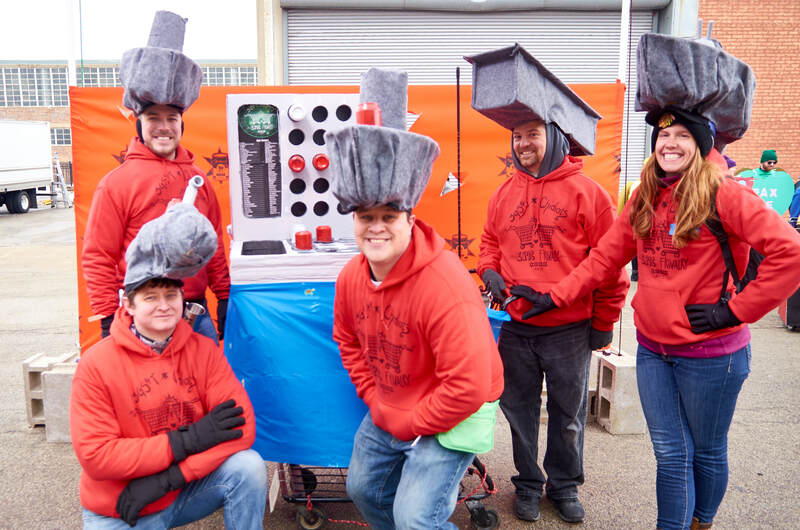 The needle never climbed above freezing on Chicago’s near West side as 245 volunteers and 96 teams of 5 costumed and thoroughly excited humans ran tricked-out shopping carts through 5 themed neighborhood checkpoints in the name of charity, prizes, and glory. Not since CHIditarod XIII has there been such a record-breaking spectacle of chaos in pursuit of feeding the hungry. 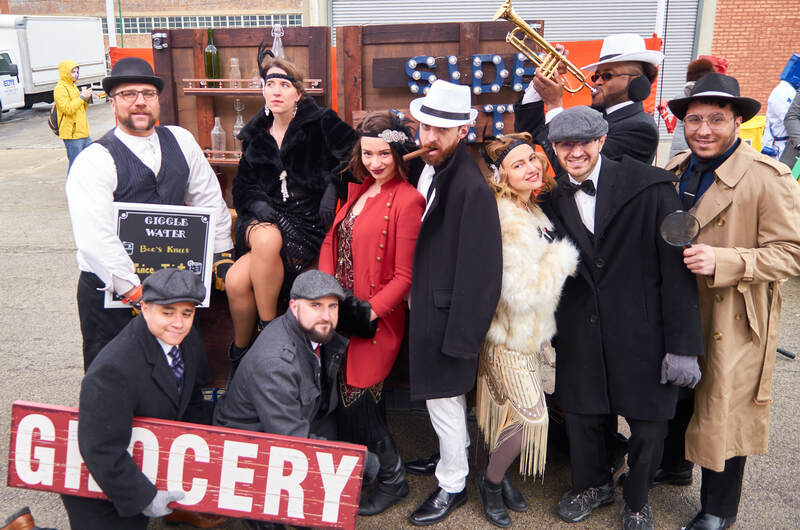 The annual philanthropic spectacle raced through Chicago’s West Town neighborhoods, with each team visiting five checkpoints each. Five Star, Mahoney’s, Phyllis’s Musical Inn, and Roots Handmade Pizza returned as crowd favorites, and we welcomed newcomer Output Lounge to the race. Each checkpoint hosted our costumed superstars with immersive themes, contests, and interactive opportunities. Our friends at Cobra Lounge graciously stepped up to host the Starting and Finish Lines. All bars have generously agreed to donate a portion of their proceeds to The CHIditarod Foundation to aid in our epic mission of fighting hunger in Chicago. 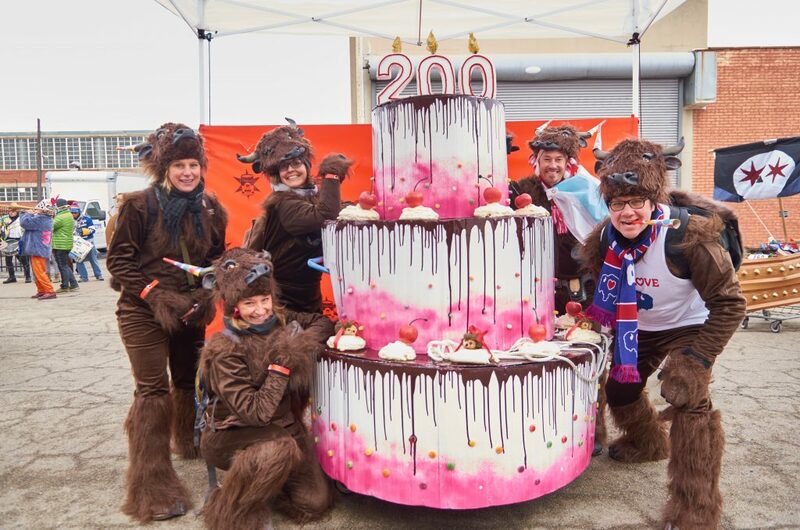 CHIditarod gleefully calls itself “probably the world’s largest mobile food drive”, and we could not be more impressed by this year’s food drive success. 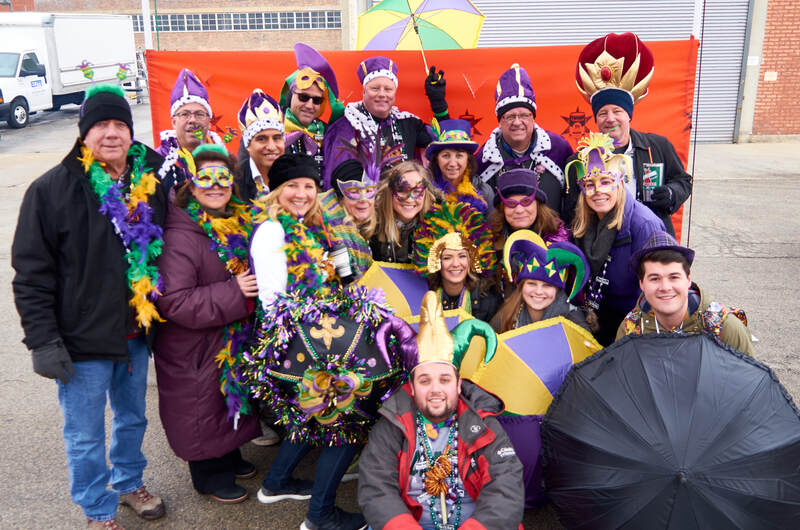 With the help of our friends at the Greater Chicago Food Depository, the CHIditarod XIV food drive collected enough food and funds to provide 18,847.5 meals for Chicago’s hungry. Thank you CHIditarod participants for being amazing all-stars and for making a difference in the lives of many, many people. 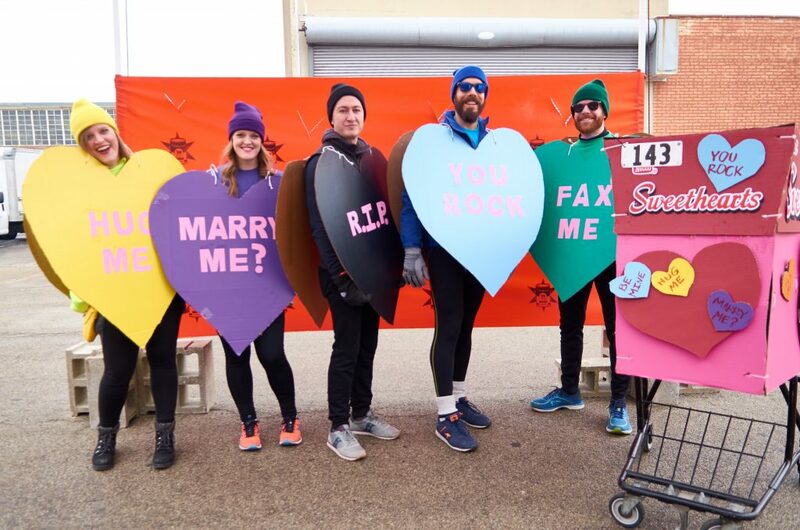 Chweethearts truly put their hearts into the cause that started CHIditarod. This team brought in 2,226.80 pounds of food to give 1,856 meals to those in need. An enormous THANK YOU to everyone for such strong participation in our annual food drive. You help us make sure no Chicagoan goes hungry. CHIvengers were our second most food drive-driven team, bringing in 2,072.80 pounds of food, equivalent to 1,381 meals! In a very close tie for third place was Cartastrophe with 1,457.30 and Chicago United Riders CHIditarod ROOKIES with an amazing 1,413.60. Everyone loves big, over the top carts brimming with art and interactivity. 2019's carts were diverse in experience, execution, and humor. Longstanding crowd favorites HoboQ went Greek this year, making sure everyone enjoyed delectable snacks, music, and of course, fire. 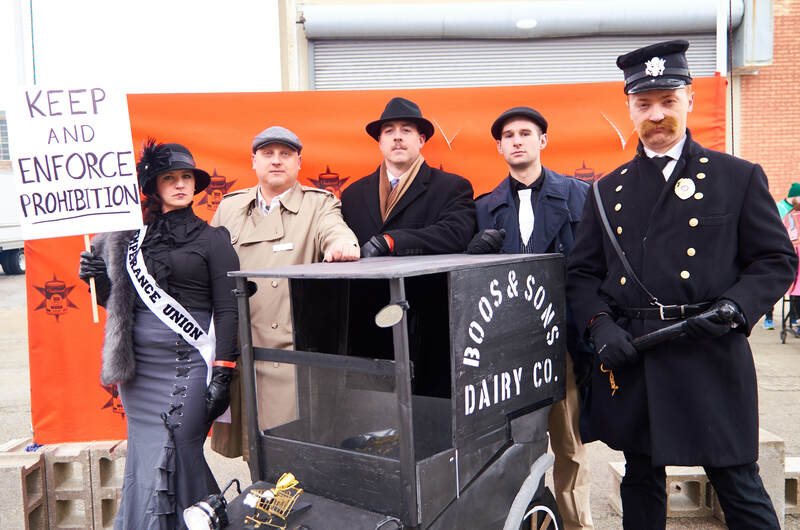 The Circus Jerks, produced by Chicago's very own Secret Gentleman’s Club, brought a 4 car circus train to CHIditarod. Exceeding 25 feet in length, it begins with a massive pink elephant (immediately followed by a poop attendant), then a gypsy hut complete with smoking chimney, an exotic animal cage featured lions, monkeys, the world's strongest man, refreshment server, a super happy clown, and the ringleader himself. Fundraising is the powerful force behind the CHIditarod Foundation's hunger-fighting grant program, providing a total of $152,000 in grants to Chicagoland nonprofits who share in our mission to end hunger in Chicago. This year alone, our racers, volunteers, checkpoints, and organizers — with the help of their families, friends, and communities — raised more than $72,000 in support of this community grants program, more than ever before. Our grant program will once again be able to support community-centered initiatives that address hunger, food scarcity, and education via the CHIditarod Grant Program. Once again 3GS&T were crowned glorious fundraising champions. For the fourth year in a row they smashed the prior year’s donation record, raising a jaw-dropping $11,299.02. 3GS&T also took home the Spirit of CHIditarod prize for truly embodying everything this charity stands for. Not only do they crush fundraising records year after year, they continue their philanthropic hunger-fighting efforts by volunteering at the Greater Chicago Food Depository on a bi-monthly basis, and taking it upon themselves to work with other 2019 teams to throw an all-team fundraiser prior to race day. Truly inspiring. In 2019, adding to the intensity of the race to the most money raised, 3GS&T was hotly chased by a team they no longer consider a rival, but call their frivals (yes that’s friends and rivals combined) -- Nomeward Bound. In an epic fundraising battle that had fans and CHIditarod Coreganizers alike watching teams jump in and out of first place, 3GS&T finally overtook Nomeward Bound, who finished second with a total $10,595.01. Nomeward Bound was truly inspiring. Insanely close to second place -- with a total of $10,003.98 -- was is a team that began fundraising strong right from the start. We are thrilled to have more teams jump into the fundraising battle and we deeply appreciate them – and everyone who contributed – for enabling our foundation to make a greater impact in 2019 than ever before. Another team that keeps amazing us year after year, CHIdiots continues making lasting impacts with $6,826.48 raised in 2019. The funds raised by the CHIdiots funds alone will fulfill more than one entire CHIditarod grant, which can help keep small organizations going all year long. Learn about the power the CHIditarod Grant Program. 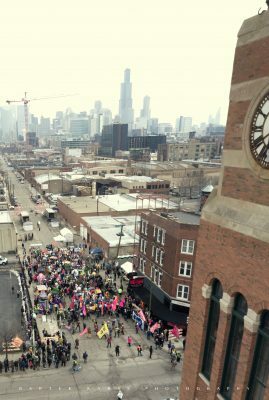 While CHIditarod racers do wondrous things, none of this would be possible without the 245 brave and selfless volunteers that made CHIditarod XIV happen. Volunteers are truly the MVPs of CHIditarod. 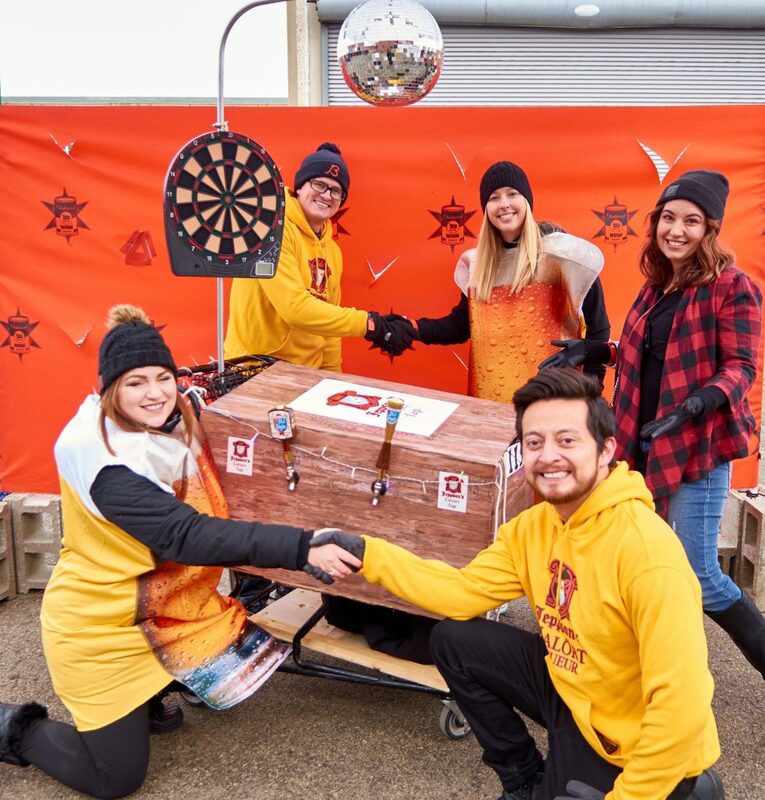 Not only do many of them fundraise, they also build the starting and finish lines, braving the (often extreme) cold, create immersive and exciting environments at our awesome checkpoints, keep you safe while mobile, and give countless hours Coreganizing CHIditarod. To our volunteers, we honor and salute you all. You are truly our heroes. Doors open on the left at CHIditarod. Starting with a full size CTA train car and realizing it need to be slightly scaled back did not take anything away from this build. 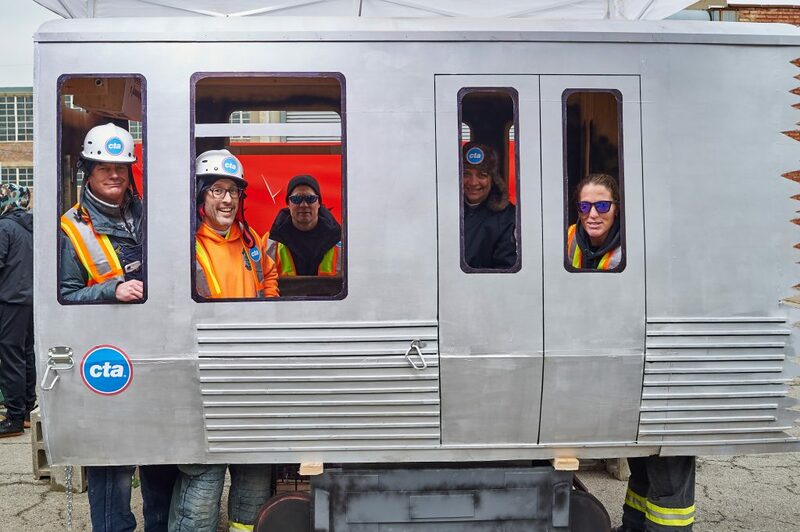 Complete with the automated voice telling you which stop was next and full uniform CTA workers (on break), this build was impressive, detailed, and obnoxiously heavy. We threw out a new challenge for the otherwise uninspired, and this team took it to the fullest extent. Our 2019 Super Bonus Challenge winner had to incorporate 3 supposedly unrelated themes into a semi-cohesive package -- (1) Hedgehogs, (2) Illinois' 200th Birthday, and (3) The Blues. The Running of the Bison(tennial) even topped it off with blue Malört cupcakes for all to celebrate. Perhaps you partied with them like it was 1999, or shared in some Y2K panic, or just toasted a midnight ball drop countdown. With an epic build and a full news crew capturing every second of a year that will never be forgotten, Y2Kweer Mishap shared happy new year vibes with everyone they encountered. 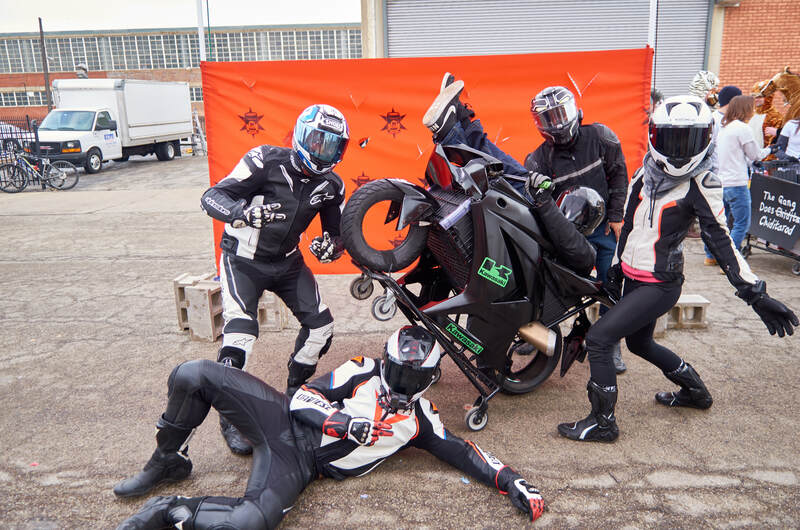 Joining CHIditarod for the first time, this team outfitted themselves head-to-toe in racing leathers, tricked out their cart as a full sport bike (complete with wheelie), brought great bribes, and even had a few dance moves. They even raised more than 1,400 pounds of food, crushing hunger in a huge way. Way to show that CHIDitarod virgins can have all the right moves. 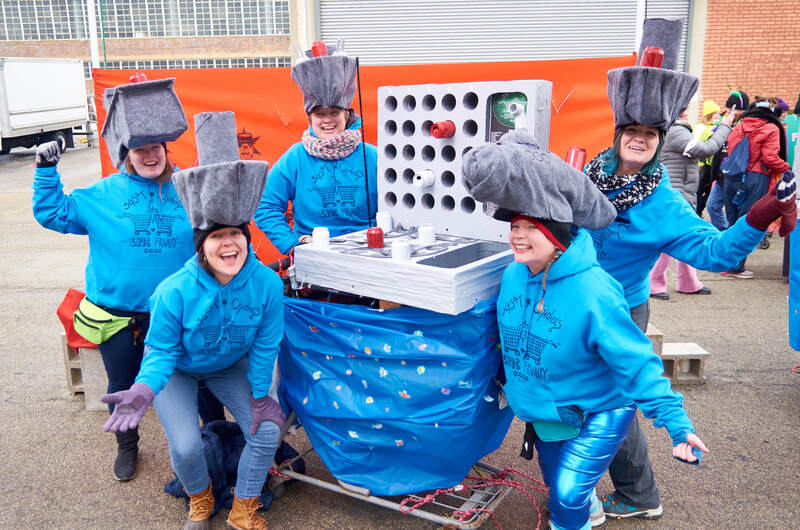 This year we also awarded a very, very special Legend Award to CHIditarod favorites -- Environmental Encroachment. Environmental Encroachment (or EE) has been with CHIditarod since the very beginning, dating all the way back to 2006. This booming brass band born from Chicago's underground art scene donates their time and skills every year to CHIditarod's starting line. We honor and salute EE for sharing their funk and flair with all of us, and you, year after year. You are CHIditarod. 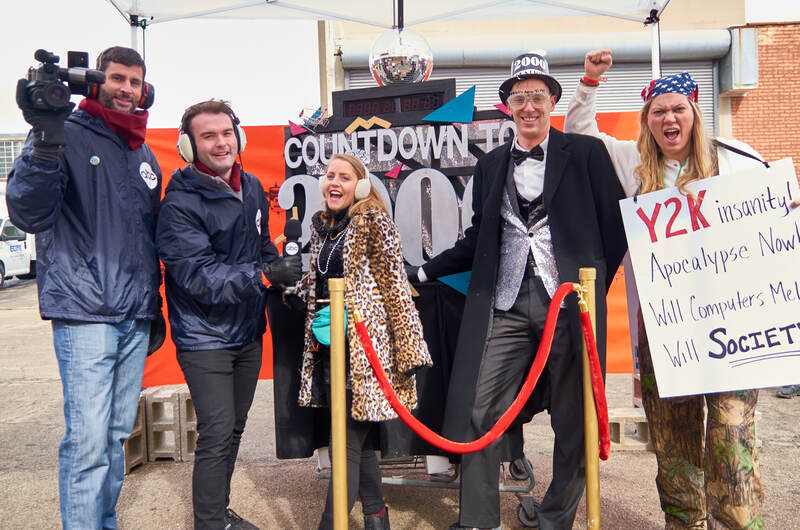 There are so many winners at CHIditarod; see below for all the fun numbers. 113 Nomeward Bound #2 Best Bribe: Rockem Sockem Containers filled with goodies, little toys and customized for each checkpoint. 149 The Rural Jurors Racing CHAMPIONS!